Create a Resolution of County or City Support for your Water Trail. Check out the signed Resolutions below and use this template to create your own. Statewide Water Trail Resolution of Support Passes Unanimously! House Resolution 281, assigned to the Natural Resources & Environment Committee, passed unanimously on March 9, 2017. This Statewide Water Trails Resolution of support recognized and encourages the proliferation and use of water trails in Georgia and for other purposes. 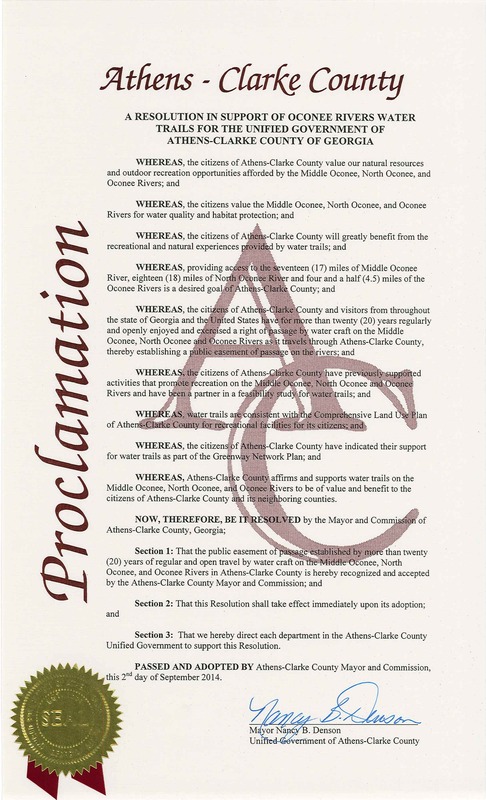 Water trail partnerships throughout Georgia can receive an appropriate copy of this Resolution suitable for framing and distributing on social media, etc. by request from the Clerk of the House (404) 656-5015 or online at https://legis.ga.gov.